Multiple-block extraction on descending platforms in the New Kingdom to Late Period part of the el-Sawayta limestone quarry near Samalut and Minya. Photo by JAMES HARRELL. The ancient Egyptians are considered “conservative” as regards technology and crafts. Yet, with their mastery of organisation, they took quarrying of stone to new levels, especially from the New Kingdom on, from about 3500 years ago. The manner, in which they quarried their huge amount of stone from then on, is reflected even in modern-day stone quarrying. 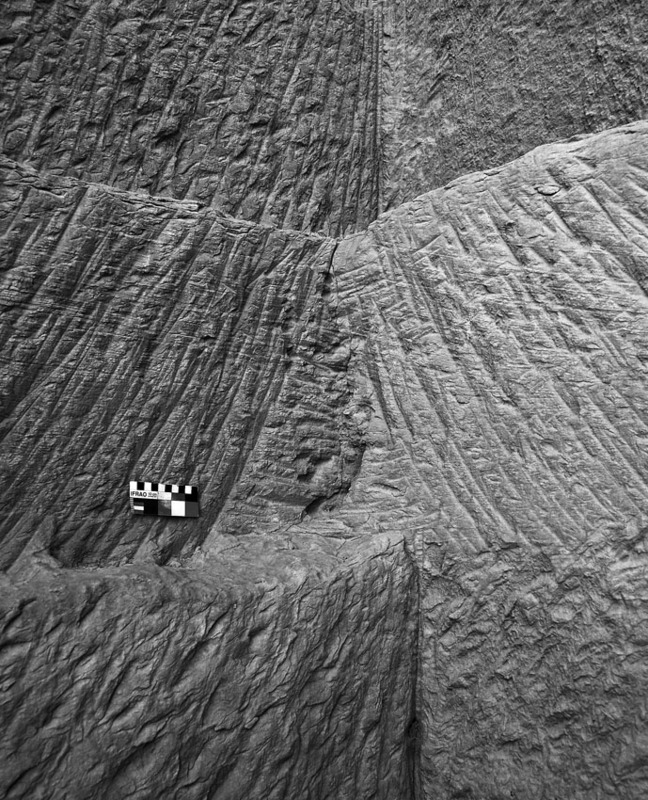 In a brand new paper James Harrell and I take a fresh look at the evidence for very systematic extraction of sandstone and limestone that commenced by the New Kingdom. Key is the introduction of very long chisels and broad extraction platforms. 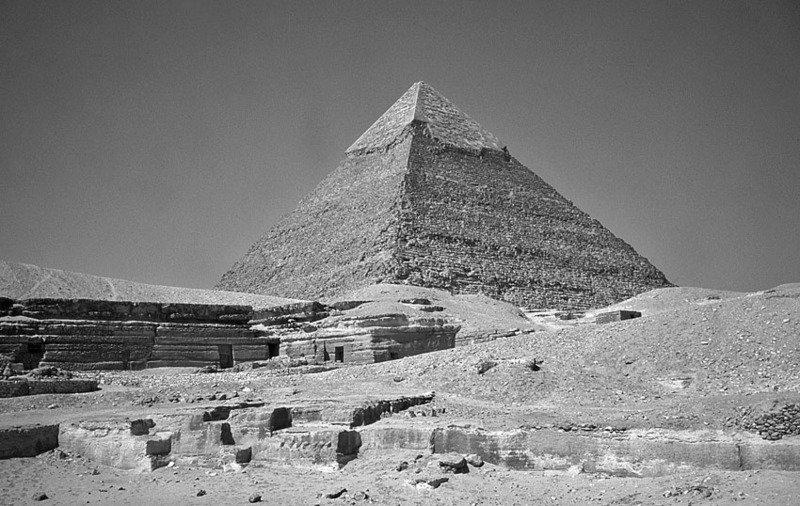 The organised quarrying was obviously related to the grand building projects by well-known kings such as Ramesses II. And it is particularly well-displayed at famous quarrying sites, such as Gebel el-Silsila between Luxor and Aswan, and el-Sawayta by Minya. We also follow the manners in which quarrying took place prior to the New Kingdom – and we look at analogies from many periods and cultures, from the Minoans until today. Read on, and you will get the abstract, a gallery of quarry images and link to the PDF. 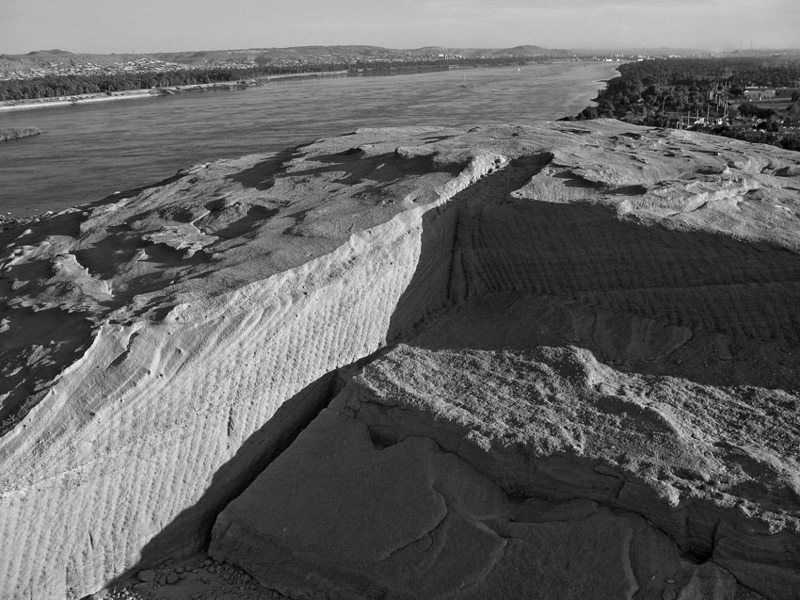 An analysis is made of the tools and methods for quarrying limestone and sandstone in ancient Egypt. It is concluded that the chisel, originally of copper and later of bronze or iron, was the principal quarrying tool during all periods, with chisels becoming longer (over 50 cm) at the beginning of the New Kingdom (about 1500 BC). Iron picks and wedges were also occasionally used during the Graeco-Roman period and perhaps also earlier in the Late Period. 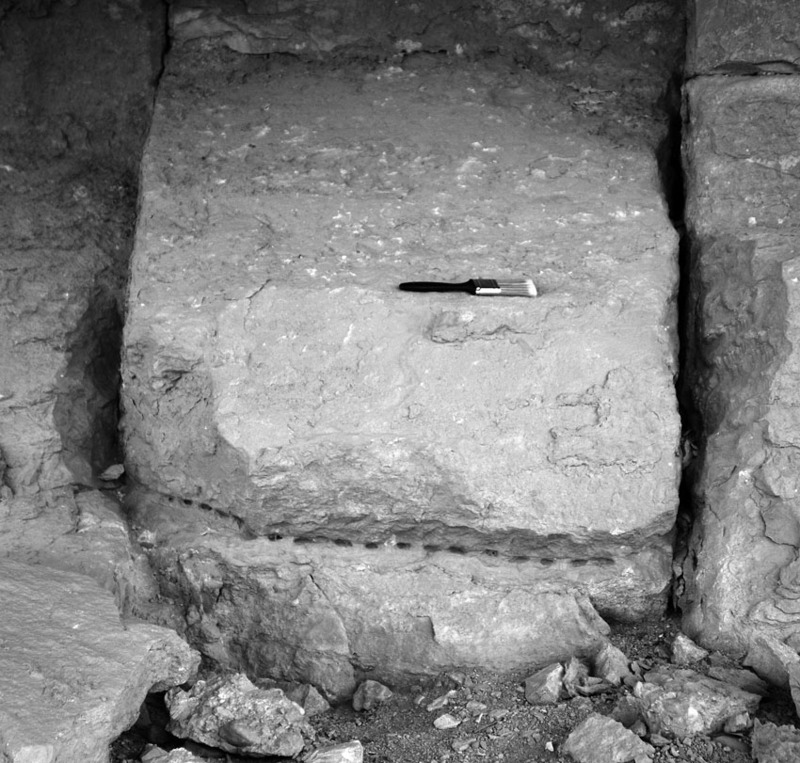 Prior to the New Kingdom, stone in open-cut quarries was mainly extracted in a non-systematic manner with blocks removed individually or in small groups. From the New Kingdom onward, quarrying was usually done more systematically with multiple blocks extracted simultaneously on descending bedrock platforms, a method of quarrying which first appeared in the early Old Kingdom (about 2500 BC). Stone extraction in the underground gallery quarries was similar in all periods with blocks removed sequentially from ceiling to floor along the walls. 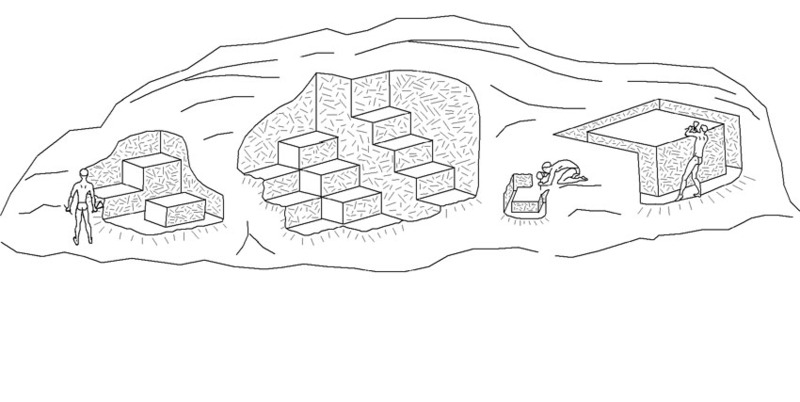 The use of descending platforms and long chisels were major quarrying innovations. Although the former continued in use up until the present day, ancient Egyptian conservatism prevented the general adoption of quarrying tools more advanced than the chisel, such as picks. 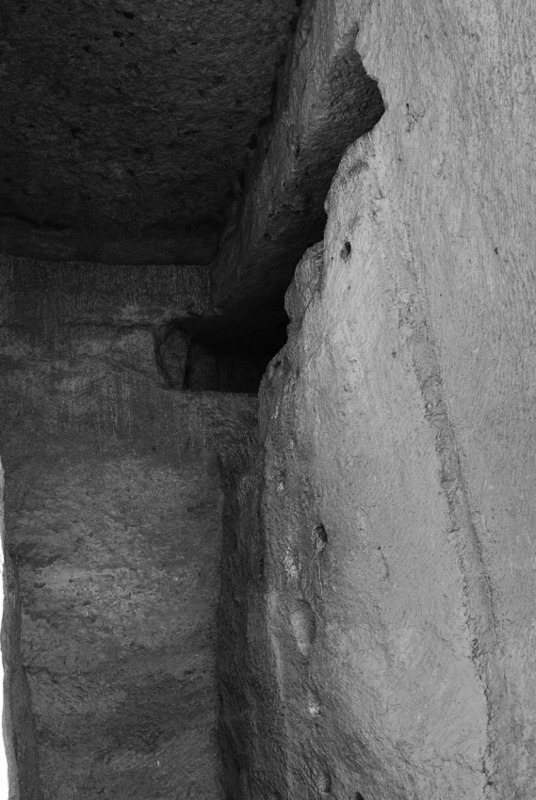 In this paper, we have relied on our own observations from many years of fieldwork in Egypt, but – of course – also on the numerous scholarly books and papers dealing with the issue. However, Egypt is a big country, with hundreds of ancient quarries, and we are dealing with thousands of years of history. Hence, it is impossible for individuals “to have seen it all”. Papers, such as this one, have to be regarded as “work in progress”. We thus very much welcome constructive critique, comments and feedback of all kinds! Multiple-block extraction on descending platforms in the New Kingdom to Late Period part of the el-Sawayta limestone quarry near Samalut. 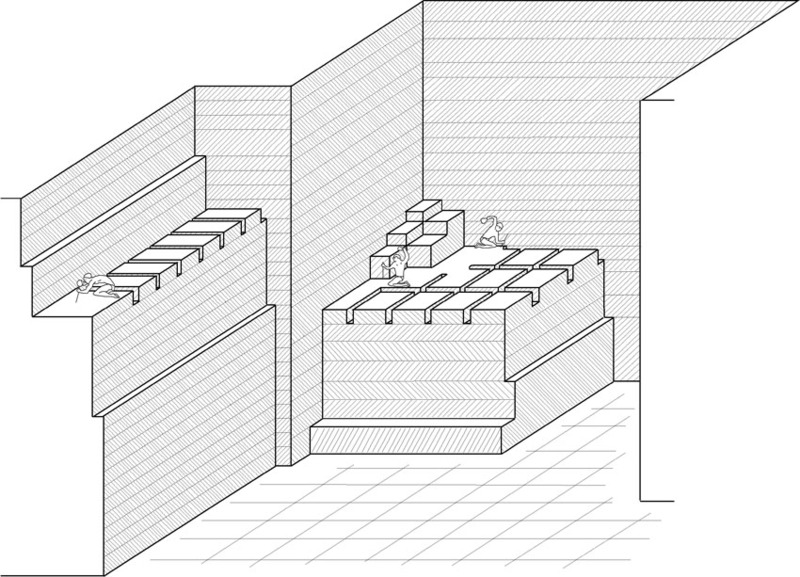 Note the wide, shallow steps left by offset platforms and, at center and at left, the two narrower but deeper, squarish platform remnants. Photo by JAMES HARRELL. 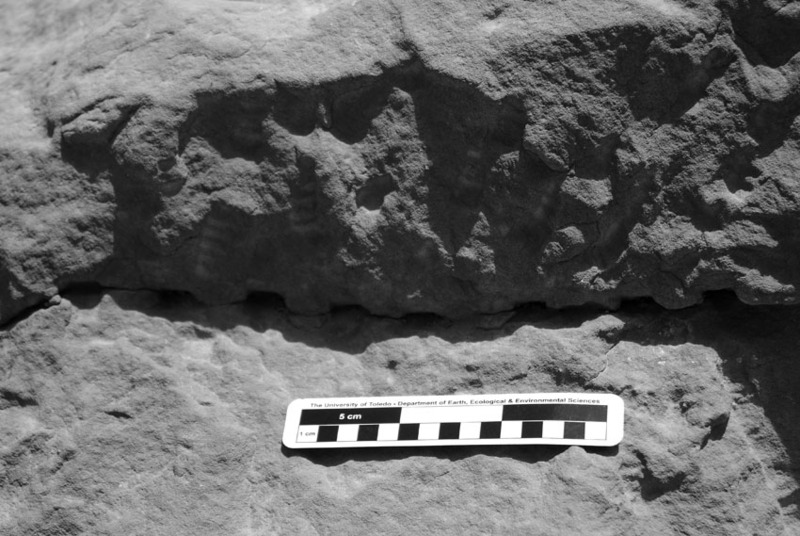 Segmented chisel tracks in the New Kingdom part of the Nag el-Hammam sandstone quarry near Gebel el-Silsila. Note the deep, narrow trench at left which must have been cut with a long chisel. Smallest scale division is 1 cm. Photo by JAMES HARRELL. (a) Bronze chisel of the 19th or 21st Dynasty. From the el-Dibabiya limestone quarry near el-Gebelein and now in the Egyptian Museum, Cairo (JE 31318; length 52 cm; photo adapted from CLARKE and ENGELBACH 1930, fig. 263). (b) Bronze chisel of the 18th Dynasty, reign of Akhenaten/Amenhotep IV. From Tell el-Amarna and now in the Egyptian Museum, Cairo (JE 64979; length 67.2 cm; photo from PENDLEBURY 1951 – vol. 2, pl. 74). The chisels are shown at their correct relative sizes. 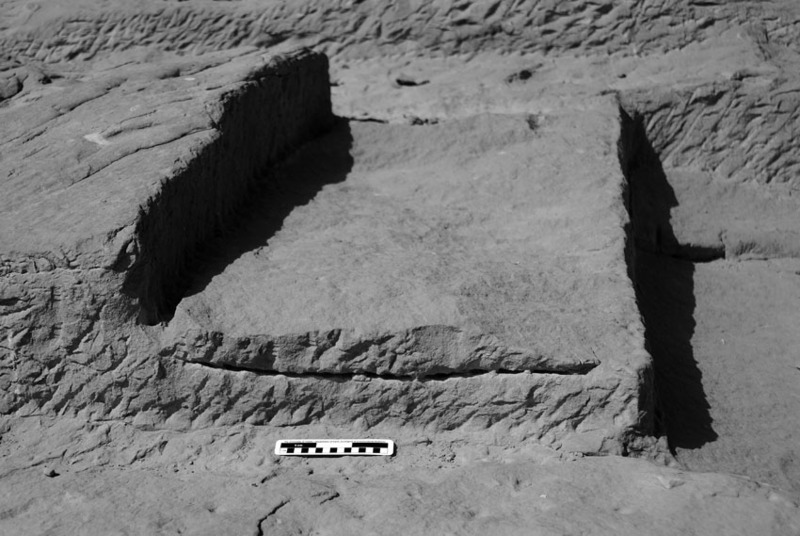 Trench cut by a long chisel in the New Kingdom part of the Nag el-Hammam sandstone quarry near Gebel el-Silsila. Note the chisel tracks running from top to bottom on the trench wall. Smallest scale division is 1 cm. Photo by JAMES HARRELL. 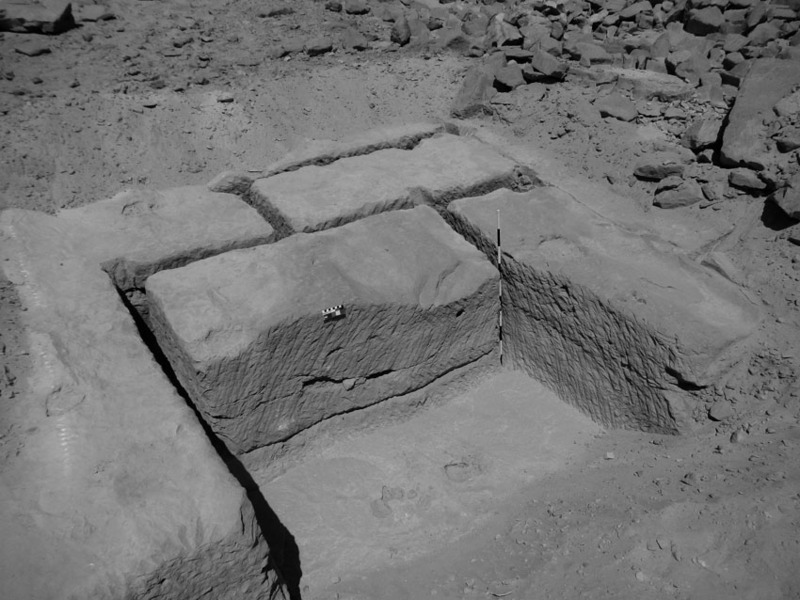 Partially extracted block in the 18th Dynasty part of the Qurna limestone quarry at Thebes. Note the line of chisel holes along the block’s base and the narrow trenches along its sides that must have been cut with a long chisel. A natural fracture separates the block’s back side from the bedrock. Brush is 21 cm long. Photo by JAMES HARRELL. 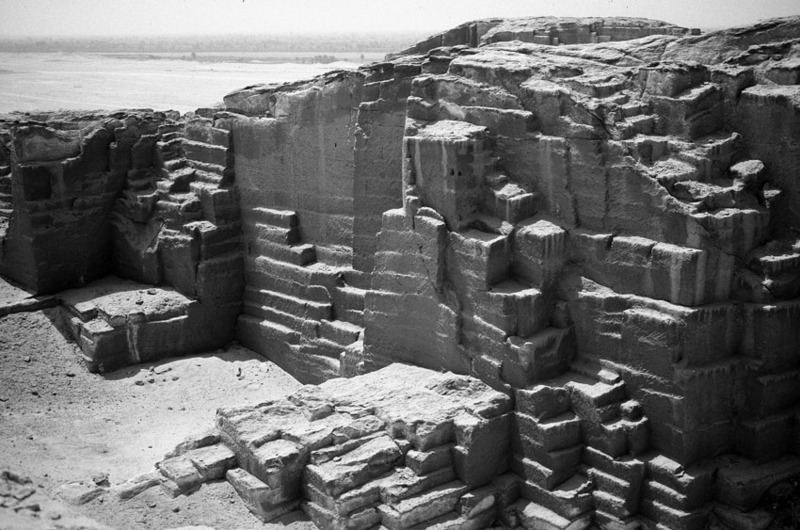 Partially extracted blocks in the Ramesside (19th-20th Dynasties) part of the Gebel el-Silsila sandstone quarry. 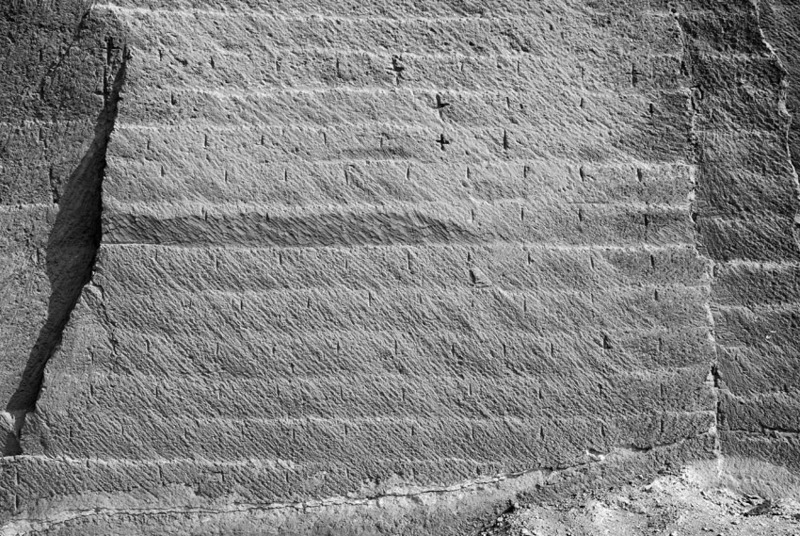 Note the two parallel grooves at the back of the leftmost trench. Smallest scale divisions are 1 cm at center and 10 cm at right. Photo by JOHN WARD. 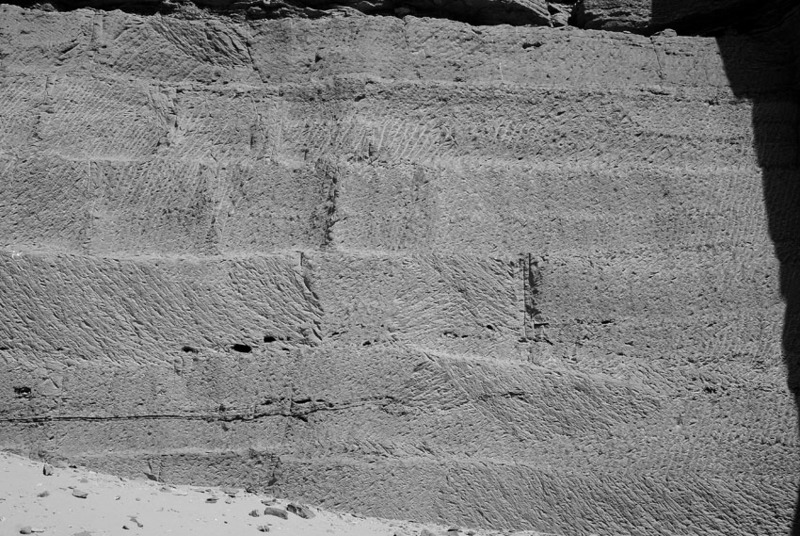 Segmented chisel tracks in the Ptolemaic part of the Gebel el-Silsila sandstone quarry. 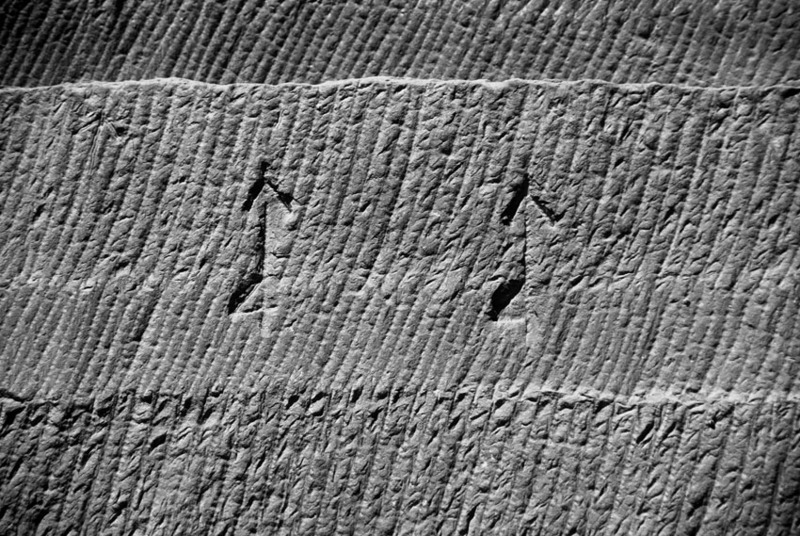 The two large ‘quarry marks’ at center (resembling a harpoon or arrow combined with the numeral four) and another smaller, fainter one at upper left (a harpoon only) symbolized the god Horus but may also have had some meaning related to the quarrying process (NILSSON forthcoming). Photo by JAMES HARRELL. 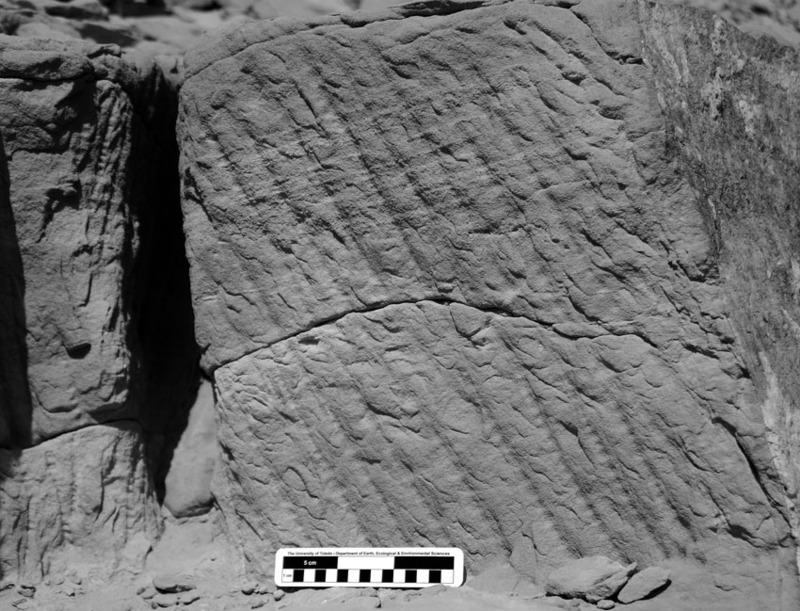 Pick (center) and chisel (top and bottom) tracks in the Ptolemaic part of the Shesmetet sandstone quarry near el-Kab. Smallest scale division is 1 cm. Photo by PER STOREMYR. 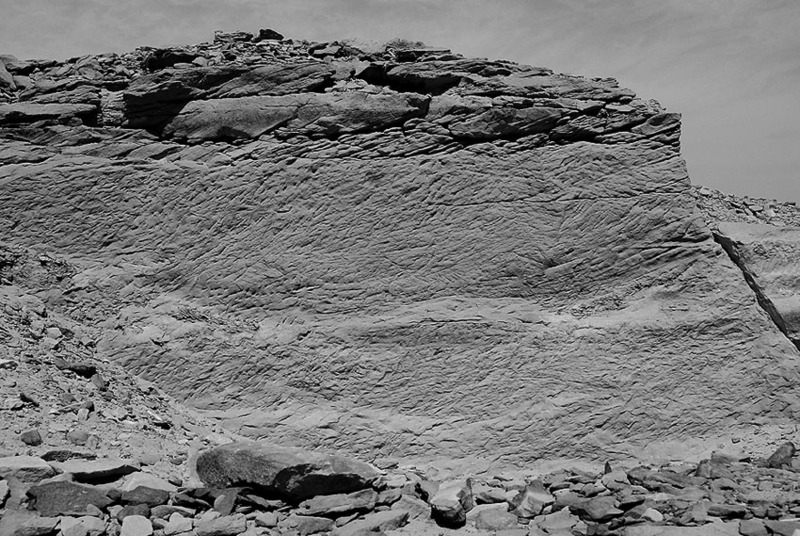 Pre-cut wedge holes along a natural fracture (at bottom center and right) and chisel tracks (on walls at left and above) in the Roman Gebel el-Qurna sandstone quarry near Aswan. Photo by PER STOREMYR. Wedge holes along the base of a block in the Ptolemaic Naq el-Fugani sandstone quarry near Aswan. Photo by PER STOREMYR. 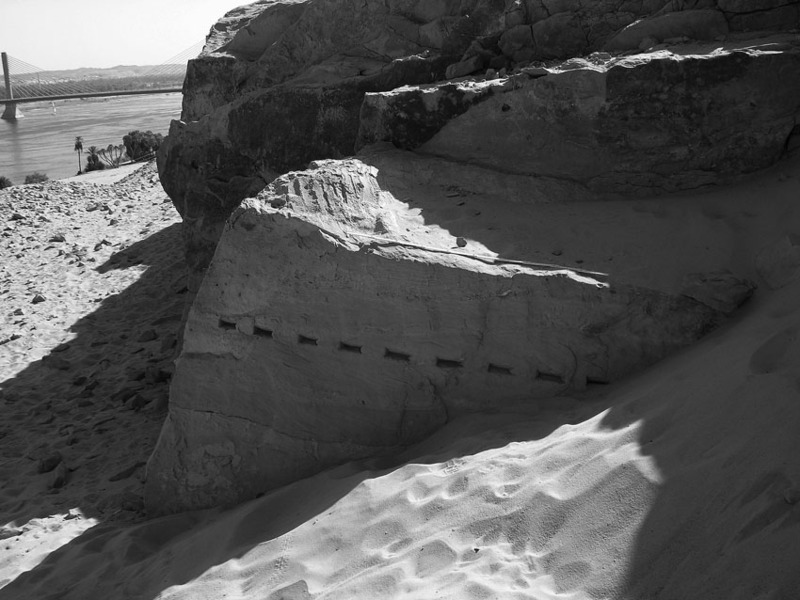 Tool marks in the Middle Kingdom part of the Nag el-Hammam sandstone quarry near Gebel el-Silsila. Photo by JAMES HARRELL. 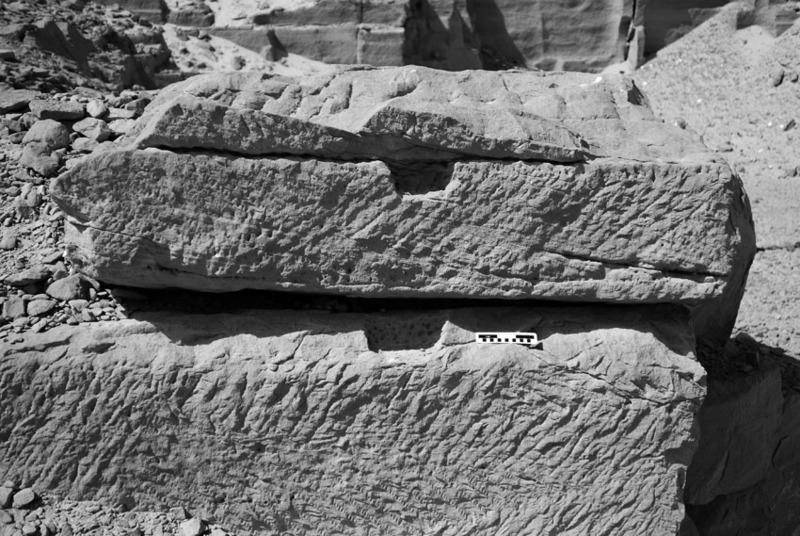 Tool marks in the New Kingdom part of the Nag el-Hammam sandstone quarry near Gebel el-Silsila. Photo by JAMES HARRELL. Chisel holes left in a failed attempted to induce a fracture along the base of a block in the Middle Kingdom Wadi Shatt el-Rigal sandstone quarry near Gebel el-Silsila. Note the chisel tracks above the holes, apparently made by the same tool that produced the holes. Smallest scale division is 1 cm. Photo by JAMES HARRELL. Lever sockets in the New Kingdom part of the Nag el-Hammam sandstone quarry near Gebel el-Silsila. 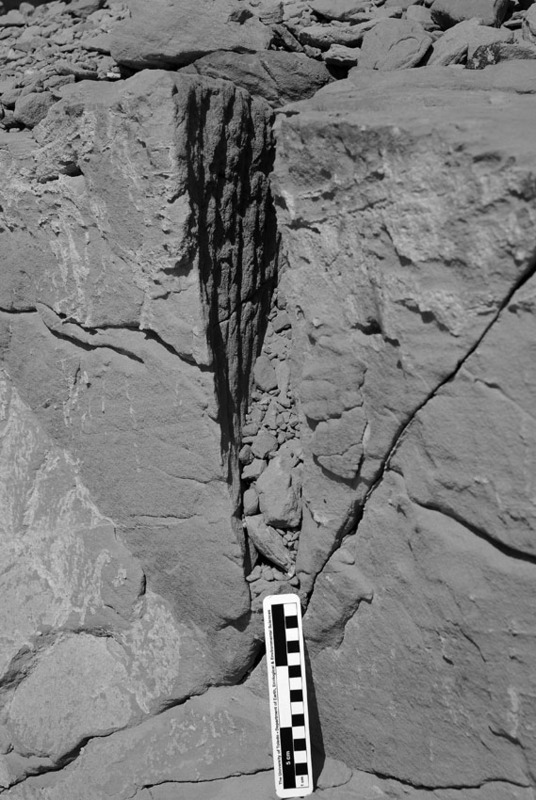 Splitting occurred along horizontal bedding planes within the rock. Smallest scale division is 1 cm. Photo by JAMES HARRELL. Chisel holes left in a failed attempted to induce a fracture along the base of a block in the Middle Kingdom Wadi Shatt el-Rigal sandstone quarry near Gebel el-Silsila. Note the rough upper surface where the block broke free of the bedrock above the line of chisel holes. Smallest scale division is 1 cm. Photo by JAMES HARRELL. 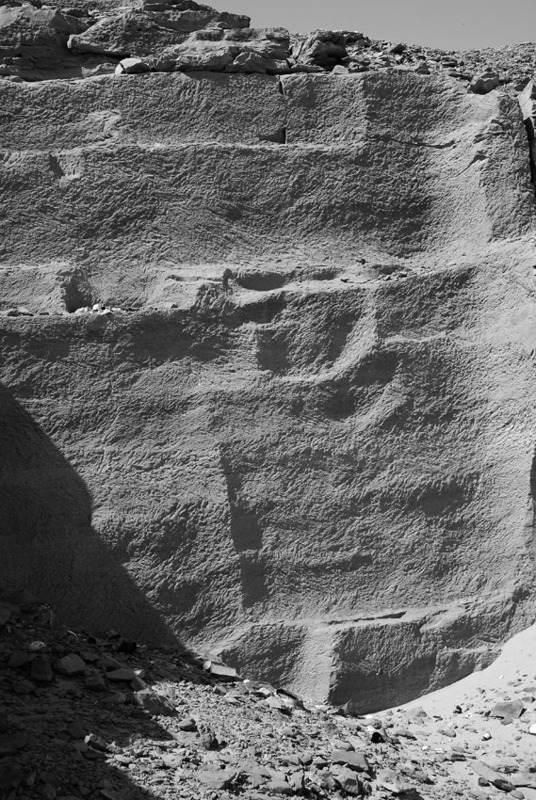 Large limestone blocks with wide separation trenches in the New Kingdom Sultan Pasha quarry near el-Minya. Photo by JAMES HARRELL. Horizontal slots undercutting large limestone blocks in the New Kingdom Sultan Pasha quarry near el-Minya. Photo by JAMES HARRELL. 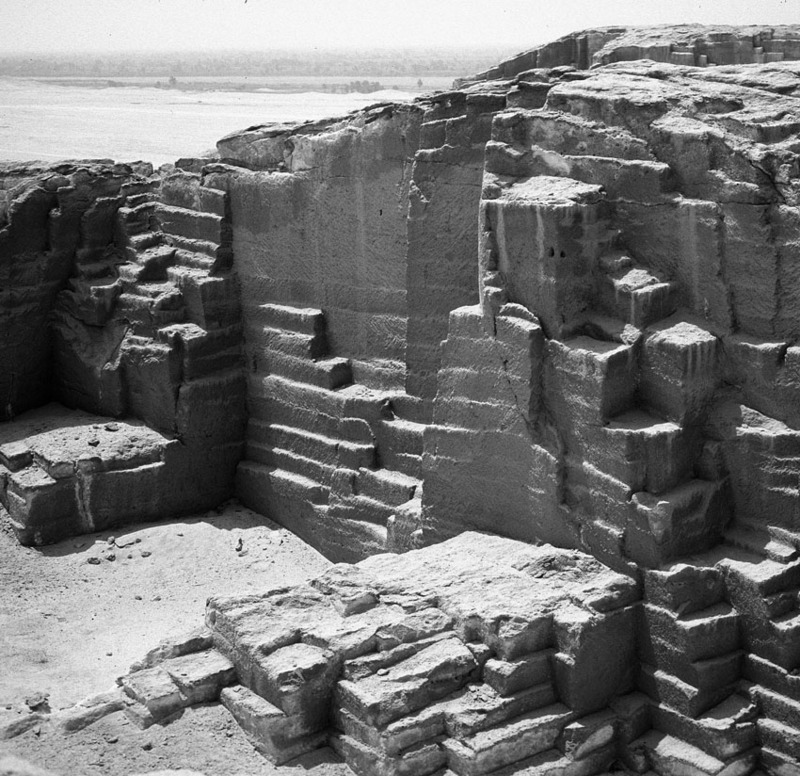 Partially cut separation trench in the Ptolemaic/Roman el-Keijal sandstone quarry near Edfu. Note the three grooves with intervening ridges. The tool marks appear to be those of a 2 cm-wide pick-adze, but a chisel is also a possibility. Photo by PER STOREMYR. 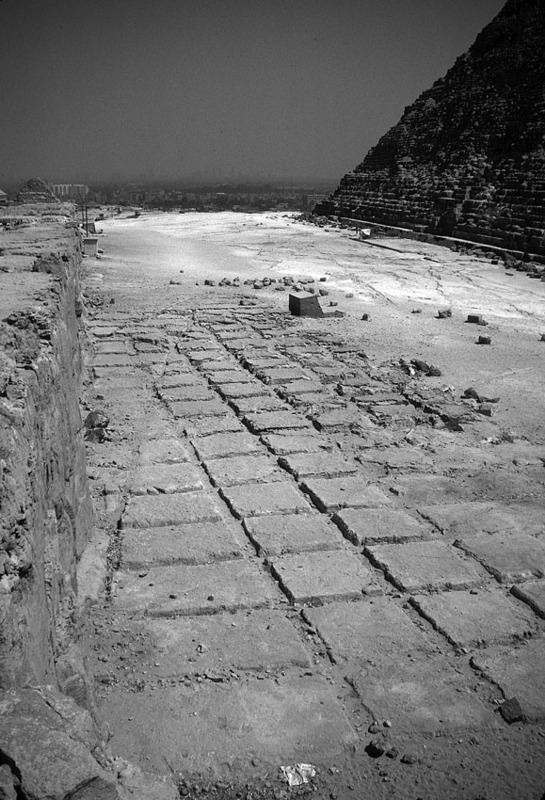 Single-block extraction in the 4th Dynasty Khufu limestone quarry southeast of the Khafre pyramid at Giza. 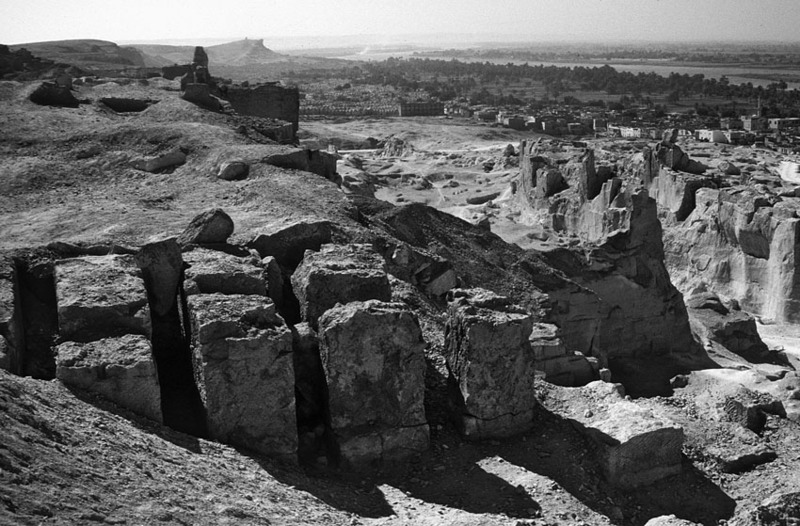 Behind the quarry in the foreground are rock-cut tombs and the Khafre pyramid. Photo by PER STOREMYR. Characteristics of small-scale quarrying by single-block extraction typical of the Middle Kingdom and earlier. Drawing by JAMES HARRELL. Characteristics of large-scale quarrying by multiple-block extraction on descending platforms typical of the New Kingdom and later. Drawing by JAMES HARRELL. Platform extraction levels on the wall of the Roman Nazlet Hussein Ali limestone quarry near el-Minya. Note the regularly spaced, vertical gashes left at each platform level representing block widths. Photo by JAMES HARRELL. 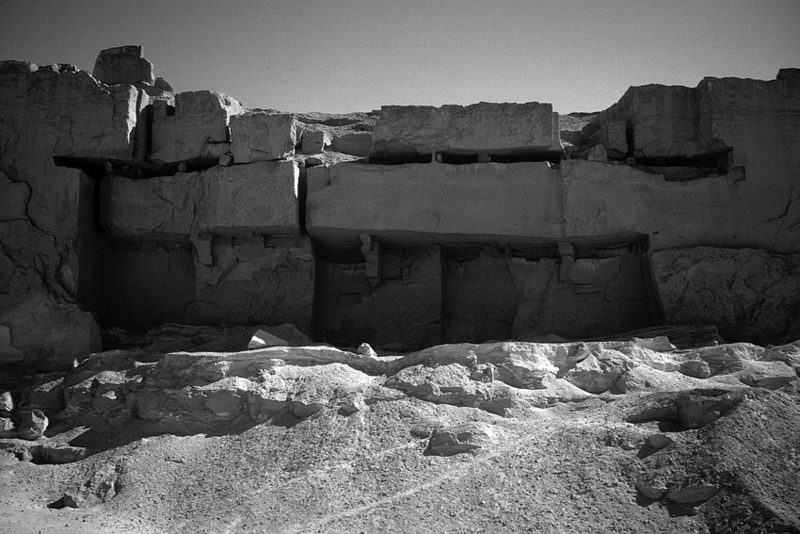 The 18th Dynasty Queen Tiy limestone quarry near Tell el-Amarna. 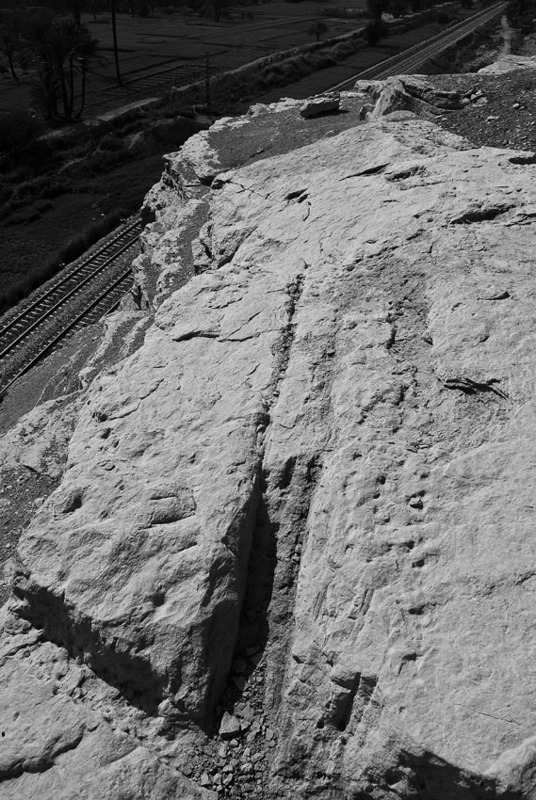 Note the parallel chisel tracks from a small descending platform at right and the non-systematic quarrying traces to the left which resemble those in Middle Kingdom quarries. Photo by JAMES HARRELL. Limestone quarry on the north side of the 4th Dynasty Khafre pyramid in Giza near Cairo. Photo by JAMES HARRELL. 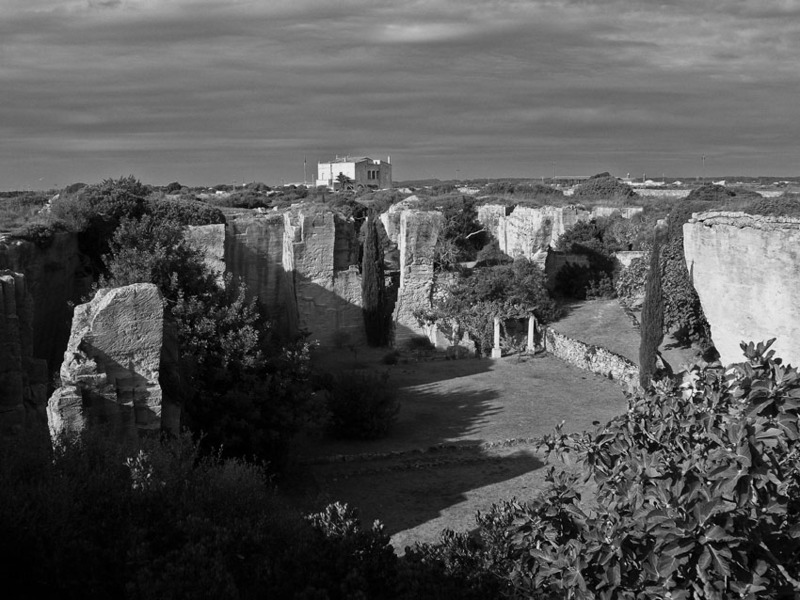 Limestone quarry in Ciutadella, Menorca (Balearic Islands, Spain), which was worked with double picks on descending platforms. Photo from Wikimedia Commons, http://commons.wikimedia.org/wiki/File:S%27Hostal_pedreres765.JPG (Licence: Creative Commons, Attribution-ShareAlike 3.0 Unported). 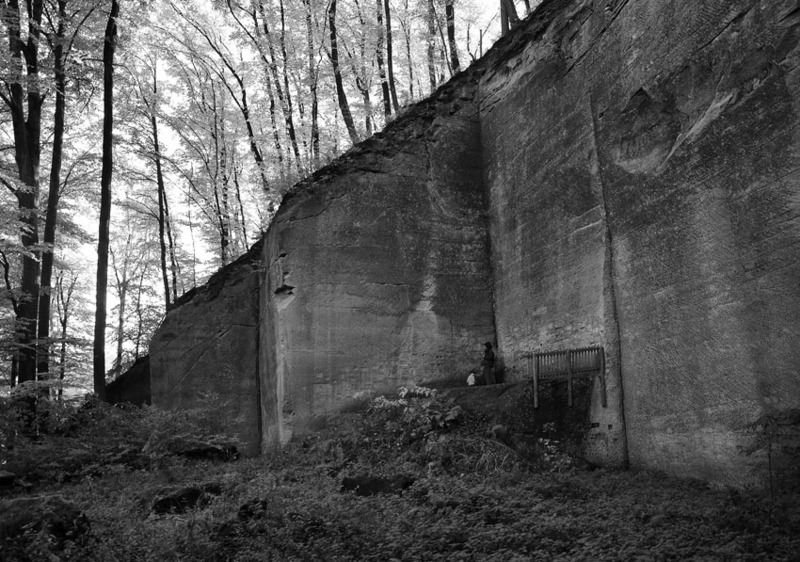 Sandstone quarry in Krauchtal, near Berne (Switzerland). In this 19th century quarry, trenches were cut with double picks on descending platforms, with a heavily deteriorated one visible at center. Photo by PER STOREMYR. 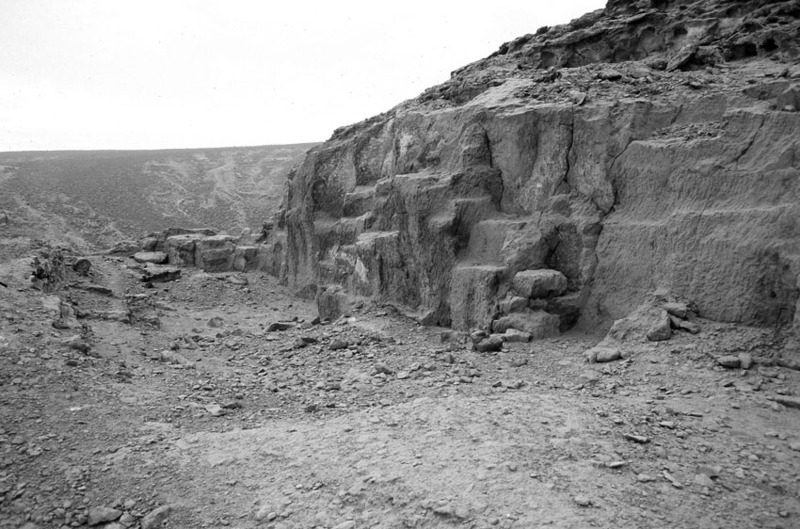 A gallery in the Ptolemaic or Roman part of the Gebel Tukh limestone quarry near el-Mansha with a horizontal slot cut at the top of the quarry face. Photo by JAMES HARRELL. This entry was posted in Ancient Egypt, Archaeology, New publications, Old quarries and tagged Ancient Egypt, ancient egyptian quarries, ancient stone quarrying, limestone, sandstone. Bookmark the permalink.